2014 Camporee to take place on May 16-18 , theme will be “WILDERNESS SURVIVAL”. The Greater New York Councils and the Maritime Industry presents a field trip opportunity for Boy Scouts and Explorers to learn more about the shipping terminals and ports. Join us for an explanation of the industry and a tour of the facility, the ports, and the shipping yards. A pizza lunch will be provided by the terminal. GNYC is sending youth and adults to Normandy to join the International Camporee commemorating the 70th Anniversary of the D-Day invasion, and Pathfinder District is sending 2 youth. In order to help the contingent meet expenses, a Spaghetti Dinner Fundraising event will be held at Berlin Lodge, at Pouch Camp, on February 22nd, from 5-8 PM. Bring friends and family for a fun-filled event. Flyer is attached. Questions may be directed to Brenda Gazinski at 718-619-0698. We at GNYC are happy to announce a new opportunity for your Scouts- a chance to join our revitalized Philmont Contingent for 2014! Each year, a select group of Scouts and Leaders are invited to join the Council Contingent excursion to Philmont Scout Ranch in Cimarron, New Mexico. This year, we’re opening up registration to all first class Boy Scouts, age 14 or older. We’re also doubling our Contingent to 20 youth and 4 adults, so there’s never been a better chance to send your Scout on this transformative journey! The journey begins with a flight to New Mexico on July 30, 2014, and ends with a return flight on August 12, 2014. Spider-Man “Community Super Hero” Scouts/Students Days on Broadway – Saturday January 25, 2014 and Saturday May 17, 2014! Workshop from 9:00 AM to 11:15 AM – Performance at 2:00PM on Broadway! Attend the 2:00pm Matinee Performance of Spider-Man with an Audience of Scouts from Across the Country! Package includes Interactive Workshop, Resource Guide and Preferred Seating to the Show! No orders taken after December 20, 2013 for January 25, 2014 or after April 9, 2014 for May 10, 2014. *Workshop location will be announced at a later date. See attached flier for full details. All That We Ask You To Bring is an Ornament for the Christmas Tree Representing Your Unit and Holiday Cards for the Soldiers……. Visit From Some Very Special Guests….. Yes it’s that time of the year again when Tom and I start planning for our upcoming Shooting Sports Weekends. To help us in our planning process we’re asking units that have participated in the past, as well as units that have expressed an interest in joining us in 2014, to please complete the attached “Commitment Form” and return same to both Tom and I by November 15, 2013. 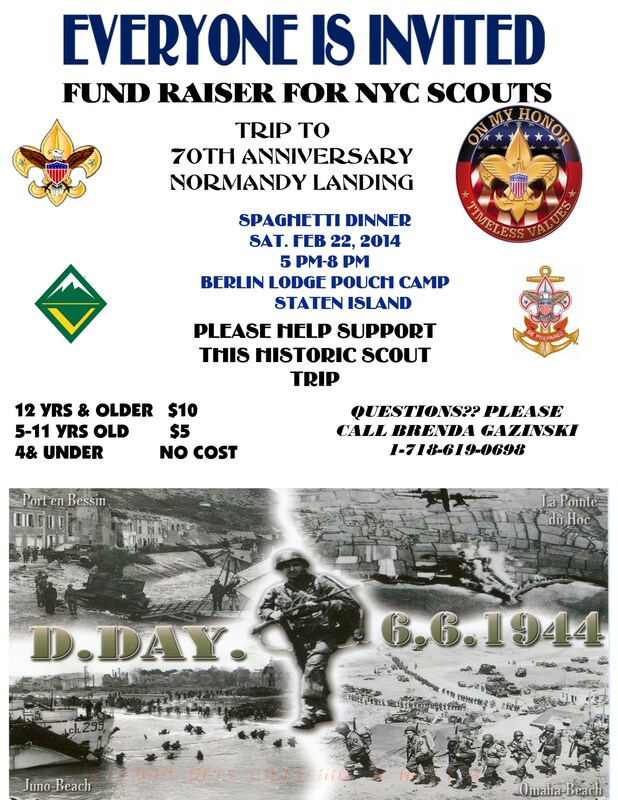 Scouts age 14-20, you have an opportunity to join a contingent of Scouts from the Greater New York Councils on a trip to Normandy, France, in April of 2014. 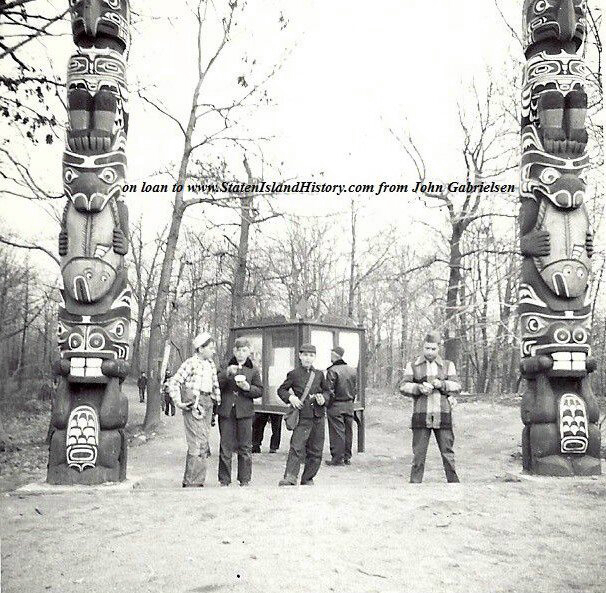 This Camporee will mark the 70th Anniversary of the D-Day invasion on the shores of Normandy. Planning for this trip includes visiting London and Paris, as well as Normandy. You may contact Contingent Leader Hedy DeBonet at 718-886-5549, or Bob Madsen at 212-651-3075 for more information. Openings are still available for youth, ages 14-20, registered in GNYC. This is open to all Scouts and Families. I wanted to reach out now that we have our official Islanders Scout Night flyer. Please see attached for more information on this special offer to your Scouts and their families. It would be greatly appreciated if you forward this email/flyer along to everyone within the Scout community you are connected with.